+ What does shipping cost? Shipping costs depend on product size, quantity, location, and other factors. Please contact us for a precise shipping quote. There is an additional $25.00 fee for residential delivery. Most of our products ship in one piece with no assembly required. The shipping company will contact you to schedule an appointment prior to attempting delivery. You will need to be present to receive the shipment. Please check for damage prior to signing for the shipment. Please contact us with any questions. + I've noticed "Starting Price" throughout the site. What does it mean? Starting price refers to the price of the product prior to any additional product options (size, acrylic color, artwork, and wood). 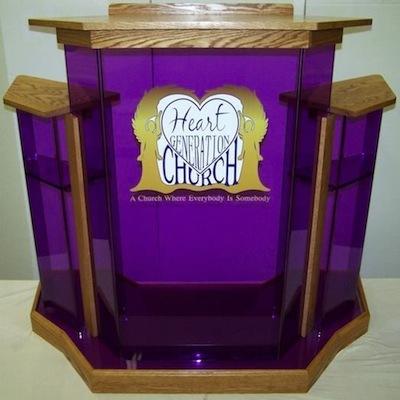 For most of our podiums, this refers to the smallest clear acrylic version without wood or artwork options. 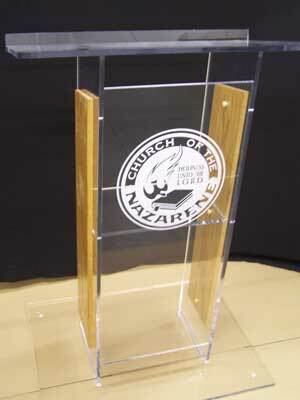 For example, the starting price of $349.00 for the standard style podium refers to a 24" Clear Standard Style Podium with no artwork or wood options. For most of our tables, this refers to the smallest clear acrylic version. 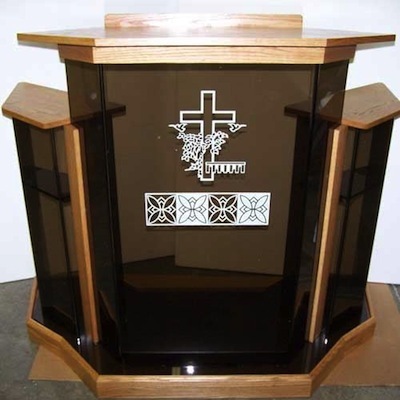 For example, the starting price of $399.00 for the communion style table refers to a 4' Clear Communion Table without wood. Note: Standard text options such as "This Do In Remembrance Of Me" are included in the starting price. Wood on some table styles is included in the starting price. There is an additional cost for logo artwork and artwork of the last supper. There are a few exceptions to these rules; please contact us with any questions. + I have a question about product styles. We organize our products around product styles, which in most cases refers to a distinct design feature or set of features. + How does product sizing work? Most of our products come in several size options. Product samples throughout the site will be accompanied by a measurement in inches. These measurements refer to the width of the product (for example, 24" Standard Style Podium refers to a standard style podium with a 24" wide by 19" deep top and bottom). Width is the primary measurement used to determine pricing because our costs are largely determined by material costs. Podium sizes range from 24" to 72", while table sizes range from 36" to 72". + What acrylic options do you offer? We offer six standard acrylic color options. + What artwork options are available? + What wood options are available? 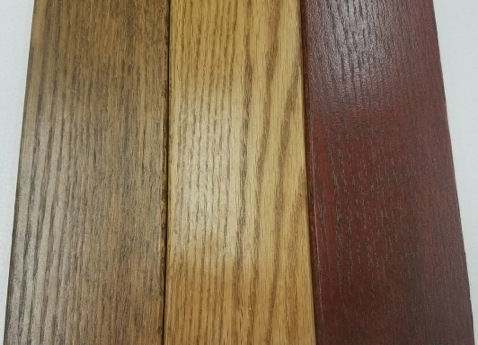 + What wood colors do you offer?